Winter is coming, and so is the post office. Britain’s Royal Mail has announced it’s releasing a collection of 15 exclusive Game of Thrones stamps. Most of them feature key characters, both living and deceased, from the hit HBO series while a few more focus on the giants, dragons, and White Walkers. There’s also a commemorative stamp book available that features behind-the-scenes content about the opening sequence, costume design, and how they made the dragons. The Royal Mail said the collection is to commemorate “significant British contribution to the production” of Game of Thrones, including a large British and Irish cast and filming locations in Ireland. It follows collections for other popular British shows likes Doctor Who. The choice of characters for the stamps is, admittedly, a bit curious. Bran Stark is nowhere to be found, even though he’s arguably the show’s designated messenger boy since he can control a crap-ton of ravens whenever he wants. Nor is there a stamp for Samwell Tarly, who wrote and sent a bunch of letters over the years. However, we do get Tywin Lannister, Olenna Tyrell, and Ned Stark, even though all of them are, well, you know. I guess it was a popularity contest more than anything else. If that’s the case, I don’t blame Royal Mail for picking Olenna over Bran. Nobody likes Bran. That said, I do think Royal Mail needs to update a few of their character descriptions on their website. 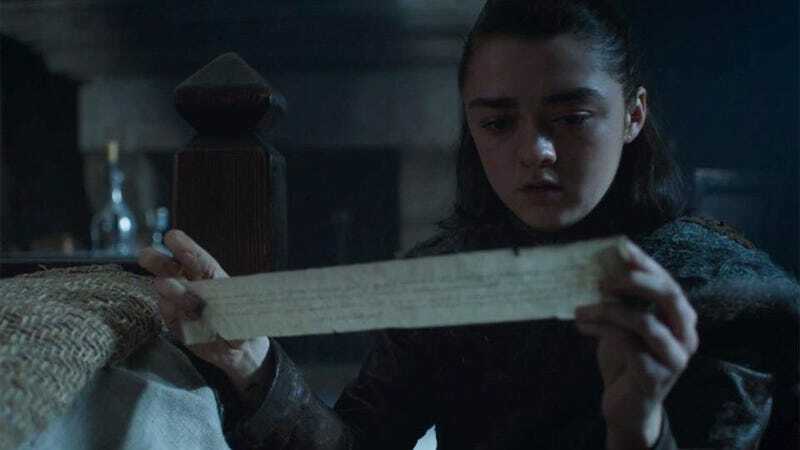 The only thing it says about Sansa Stark is that she was “held in King’s Landing by the Lannisters after her father’s murder.” I’m pretty sure a few things have happened since then. If you live in Britain, you can pre-order the stamps here. They’ll be available January 23.